An image from the video of the Aug. 29 arrest of Darryl Jackson Jr.
A controversial arrest in the city of Valparaiso, Indiana, in August has been resolved amicably, and could serve as a model for easing tensions between law enforcement and communities of color nationwide. 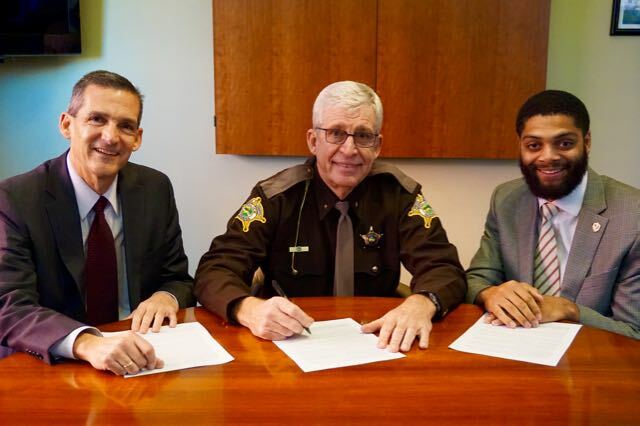 On Tuesday, Porter County Sheriff David Reynolds, Valparaiso Mayor Jon Costas and local resident Darryl Jackson, Jr. issued a joint statement that they said was the result of a collaborative dialogue. The 24-year-old Jackson, who is African-American, was arrested on Aug. 29 in the mostly white, affluent city of Valparaiso for resisting arrest and failing to identify himself. He was parked along a residential street waiting for a friend to come out of a house when police approached him. In a police dash-cam video released to local media, Jackson asks the arresting white officer why he is being targeted. The officer, part of a Porter County gang task force asks the man to get out of the car and then asks for identification. Jackson refused and was arrested soon after. At the time Sheriff Reynolds, who oversees the gang unit, said the officer did nothing wrong. A few days later after the Porter County prosecutor’s office declined to pursue criminal charges, Mayor Costas called into question the professionalism of the arresting officer. In the weeks that followed police groups condemned Costas’ “rush to judgment” while a group of local activists and students at Valparaiso University defended Jackson. Tensions came to a head last month at a packed meeting of the city&apos;s Advisory Human Relations Council which was considering a resolution on the matter. But now, all sides seem to be moving on. Sheriff Reynolds said he accepted Jackson’s apology. The sheriff promised to hold quarterly dialogues with residents. Mayor Costas, meanwhile, hopes Valparaiso, a city with a history of racial strife, can learn from the episode. WBEZ’s Michael Puente covers Northwest Indiana. Follow him on Twitter @MikePuenteNews.